Learn how Wells Fargo Bank grew from an express delivery company for the California gold rush to the third-largest bank in America by assets and market cap. The history of the bank known today as Wells Fargo & Company parallels the history of the United States. A lot of people might not know it, but Wells Fargo didn't start off as a strictly financial institution like it is today—there was a time when it offered a logistics component to its services. Back in 1852, it was founded as a banking and express delivery company linking the busy East Coast with the booming Gold Rush in California. Today Wells Fargo is the country's third-largest bank by market capitalization and the third-largest U.S. bank by assets. It's currently one of the most dominant forces in the financial industry, not just in the United States, but across the whole planet. To understand Wells Fargo today, we need to look closely at its past, from its roots as an Old West stagecoach company all the way up to its current dominance. The Founding of Wells Fargo & Co.
Back in 1848, gold was first discovered in Sutter's Mill, California, and the subsequent "Gold Rush" saw 300,000 "Forty-Niners" move to the state over the following year. In 1846, San Francisco was nothing more than a tiny settlement of 200 residents. By 1852, San Francisco was a boomtown with 36,000 inhabitants. Businessmen in the east took notice. The rapidly emerging West Coast economy caught the attention of American Express co-founders Henry Wells and William D. Fargo. (Fargo, by the way, is also known for his tenure as the Mayor of Buffalo, New York, from 1862 to 1863 and again from 1864 to 1865). Wells and Fargo couldn't convince their third American Express co-founder—John Warren Butterfield—to extend the company's operations to California. The eponymous pair stayed on with American Express but also partnered to create their own separate company, forming Wells Fargo & Co. in 1852. Wells Fargo's new offices were established in San Francisco, where it operated as a bank and a delivery service for the gold industry and all of its offshoots. They invested in procuring the best stagecoaches available at the time. Each one weighed 2,500 pounds and cost about $1,200 in the 1860s (the equivalent of around $30,000 in today's money). The system of Wells Fargo stagecoaches covered 3,000 miles, starting in Nebraska and ending up on the west coast. Then in 1860, Wells Fargo took over a company called the Butterfield Overland Mail Company, giving it control over the western leg of the Pony Express delivery route. Although this business venture was killed off by the telegraph in 1861. Fortunately, Wells Fargo & Co. was so well established, the demise of the Pony Express didn't cause the company to fail. Although its early years saw Wells Fargo & Co. establish itself as the go-to for moving freight between New York and California, it also offered banking and financial services. You could go to a Wells Fargo & Co. office to buy or sell gold in the form of bullion, dust, or coins. The company established express delivery and banking offices in communities throughout the California gold fields. Just as the invention of the telegraph made mail delivery by horse obsolete, the introduction of the U.S. transcontinental railroad system rendered stagecoaches useless as well. Wells Fargo's stock began to fall, but it was saved by its 1869 purchase of the Pacific Union Express Company (which operated the Central Pacific Railroad). In return for paying a super-high price for the company, Wells Fargo got exclusive rights to use the railroad for its express freight deliveries for the next 10 years. In 1871, there were 436 Wells Fargo & Co. banking and express offices in existence. By the turn of the century, there were 3,500 Wells Fargo branches. The final 30 years of the 1800s were particularly successful for the company. Coast-to-coast on one train. Wells Fargo established the very first railroad route operating uninterrupted from New York to San Francisco. It was known as the Transcontinental Express and was created through the integration of more than a dozen smaller railroads. On its very first trip, the Transcontinental Express pulled into San Francisco just three-and-a-half days after it left New York City—a truly amazing feat at the time. Expansion across the USA. By 1876, Wells Fargo & Co. had branches in Virginia City, Nevada; Carson City, Nevada; and Salt Lake City, Utah. An office was opened in New York City in 1880, and the company was shipping freight within the lucrative East Coast market by 1888. Other innovations in the 1880s included the implementation of refrigerated rail cars in California and the introduction of money orders as a financial product. Up until 1876, Wells Fargo's express shipping and banking departments operated in the same San Francisco building. That year, the banking and express locations were separated into two different San Francisco buildings. Express and banking services were split up. By 1905, the banking and express operations were completely separated. Wells Fargo Bank merged with the Nevada National Bank to become the Wells Fargo Nevada National Bank in 1905. Meanwhile, the Wells Fargo & Company Express shipping company continued to operate until 1918. That year, the U.S. government forced it to merge with all the other major rail carriers. World War One killed Wells Fargo Express. The creation of the amalgamated American Railway Express was a response to World War One and basically caused Wells Fargo & Company Express to cease to exist. All of the company's logos were taken down from trains and stations and replaced with the American Railway Express logo. All that remained of Wells Fargo were its banking operations, which have continued to this day despite multiple financial crises. There was virtually no regulation over the California banking industry when Wells Fargo started in the 1850's. Anyone with a safe and a room to put it in could call themselves a bank. Since there were no rules like mandatory bank reserves, many banks of the era were vulnerable to fluctuations and panics. The flow of gold dried up. In 1855 a drought in California caused the streams to dry up, which meant people were unable to mine for gold along stream beds. The lack of incoming gold caused a panic and nearly 200 businesses in San Francisco closed up shop, including Wells Fargo's biggest competitor. Other companies' losses were Wells Fargo's gains. Since Wells Fargo was the only express company still standing after the panic, it grew even stronger. It had been able to make it through the panic easily since it had such a strong financial position before it hit. In 1906, three-quarters of San Francisco was destroyed by a devastating earthquake and the subsequent fires. Its customer info was under rubble. All the information on Wells Fargo's bank accounts was trapped in a fireproof vault at its headquarters, yet it continued to distribute money based on the word of customers. The dust finally settled and the account records were retrieved. Amazingly, after distributing hundreds of thousands of dollars to customers based solely only on their word, Wells Fargo tallied and compared all disbursements made and found that it only overpaid by $200. Yet another panic occurred in 1907, this time among banks in New York. Some banks were manipulating the stock market and experienced an unexpected run when stock market speculators couldn't pay for the stocks they'd purchased. Other banks saw people coming in to empty their accounts in the wake of the events in New York, and the problem soon became nation-wide. The bank lost huge amounts of capital. Wells Fargo lost $1 million in deposits every week for six weeks in a row. Over the decade following the panic, Wells Fargo went through a long process of recovery, attempting to build itself back up to where it had been previously. The 1920's were a boom for Wells Fargo. In 1920, the company appointed a new president, Frederick L. Lipman, who focused on expansion while maintaining conservative banking practices. 1924 saw Wells Fargo Nevada National Bank merging with the Union Trust Company to become the Wells Fargo Bank & Union Trust Company. The 1920's were highly profitable years for Wells Fargo. Then the Depression happened. Thanks to Lipman's careful investments of the bank's earnings in the 1920s, it was in a solid position when the Depression hit. In fact, when the banking system collapsed in 1933, Wells Fargo was able to help other banks with immediate and substantial financial support. Its very able president was able to steer the bank through the Great Depression—declaring with firm resolve, "We shall function as usual, meeting all demands under any circumstances." Over the rest of the 20th century, Wells Fargo continued to show steady growth despite a series of ups and downs. By 1954 its name was shortened to Wells Fargo Bank, to capitalize on the Old West frontier image. In 1967, Wells Fargo became an innovator in the credit card world, introducing its Master Charge card. This would eventually go on to become one of the world's best known credit cards, Mastercard. It got bigger and bigger through mergers. A steady series of mergers with smaller banks caused Wells Fargo to grow domestically and internationally. However, the bank's leadership decided to scale down and focus on the California market in the 1980s, which helped the company to thrive well into the 1990s and beyond. The reason for the shift was a new focus on real estate lending. Wells Fargo left risky commercial real estate lending to other banks and focused on the booming home and apartment mortgage market emerging in California in the eighties. Real estate lending boosted the bottom line big-time, and today Wells Fargo is the top lender among the big banks for the home mortgage market. Recession-proof leadership. The recession of the 90s didn't hurt Wells Fargo, as it continued to post gains. The key once again was good management. The leadership of Wells Fargo put aside a whopping $3.1 billion from 1991 to 1993 just to protect against expected loan losses in the midst of the market downturn. It turned out the company only took $1.9 billion in loan losses during that period, so the remaining $1.2 billion set aside for losses was posted as profit. By the end of 1994, investors who had purchased Wells Fargo stock had seen a 1,781% return on their investment over the previous 12 years. Once again, due to its impressive management, Wells Fargo thrived during a period of economic instability when most financial institutions suffered. No financial institution was left unscathed by the damage brought in by the subprime mortgage crisis that started a year earlier in 2007. But some, like Wells Fargo, fared much better than others. Benefited from a bailout. As part of the industry-wide federal bank bailout of 2008, Wells Fargo received $25 billion in capital through the sale of its stock to the U.S. Treasury Department. Wells Fargo then made more stock in the company available to the public and raised an additional $8.6 billion. By the end of 2009, the federal government was able to sell back its $25 billion in stock and collect more than $130 million in dividends. Snapping up companies left and right. In 2007 and 2008, Wells Fargo acquired at least six different banks, financial institutions, and companies. Many of these acquisitions were a steal. For example, in 2007 Wells Fargo bought Greater Bay Bancorp for just $1.5 billion, even though the company had $7.4 billion in assets. Wachovia was the ultimate coup. In September 2008, in the middle of the Wall Street financial panic during which companies like Lehman Brothers folded, Wells Fargo made an offer to purchase Wachovia Corporation. Wachovia (a bank specializing in investment products) had already agreed to sell to Wells Fargo's competitor Citigroup for $2.2 billion. Wachovia was on the brink of going under as a result of the financial crisis, so it was ready to take whatever it could get to cut its losses. Wells Fargo offered $15.1 billion, and Wachovia accepted (much to Citigroup's chagrin). As a result, Wells Fargo was transformed into a super bank, with coast-to-coast operations, $1.4 trillion in assets, and 48 million customers. It was also able to establish the Wells Fargo Securities line of investment services based on the strength of Wachovia's investment banking. Once again, through savvy management, shrewd tactics, and strategic decision-making in a time of crisis, Wells Fargo was able to grow in strength while many companies wasted away and finally perished. Today Wells Fargo Bank has almost countless financial products and services for its customers. An industry leader for loans. It provides the most residential mortgages among the major banks (with 31% of all mortgages among the top five banks). Wells Fargo also leads the competition in providing retail loans for small businesses (29% of retail loans among the largest five). 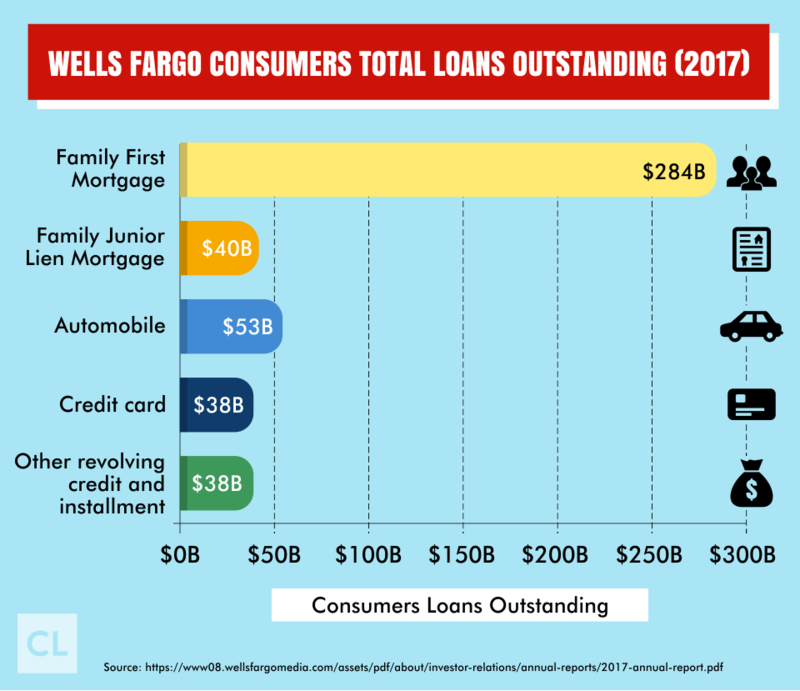 In fact, when all of the loans in all categories are added up among the major banks, Wells Fargo is number one when it comes to the total amount of money loaned out. In Q3 of 2017, the outstanding loans Wells Fargo was financing totaled $946 billion. Its nearest competitor, Bank of America, had loaned out $933 billion. Cross-selling was the key. One of the reasons Wells Fargo has been so successful at lending out money is due to its policy of training its employees to cross-sell financial products. Examples of cross-selling include when a telephone banking operator offers you a credit card, even though you called them to help with a bank transfer. Or, when a bank teller tries to sign you up for a line of credit even though you didn't mention you were interested in one. Wells Fargo became highly respected as the industry leader in cross-selling different products to its banking customers. Then something went very, very wrong. In 2016, Wells Fargo was fined $185 million as a result of illegal activity involving the creation of millions of fraudulent accounts. Wells Fargo customers suddenly found they were paying new fees for new accounts they never signed up for. These customers discovered they had new lines of credit, credit cards, and deposit accounts they never applied for. Over 2 million fraudulent accounts. Investigations by agencies including the Consumer Financial Protection Bureau found 1,534,280 fraudulent deposit accounts had been opened between 2011 and 2016. Over the same time period, Wells Fargo employees had opened 565,433 credit cards without clients' consent or authorization. Some of the stories that emerged weren't pretty. Pressure from management, in the form of unrealistic sales quotas and pressure to be aggressive in sales tactics, generated outrageous behaviors by Wells Fargo staff creating fake accounts. Investigations discovered Wells Fargo employees had been signing homeless people up for fee-based accounts just to make their sales quota. Some employees were found resetting client PIN numbers and enrolling them in new programs and products, sometimes moving money from their existing accounts into new ones. Thousands of heads rolled. Between 2011 and 2016, Wells Fargo fired approximately 5,300 employees for conducting fraudulent sales. In the wake of the investigation, Wells Fargo's then-CEO John Stumpf found himself in front of Elizabeth Warren and the Senate Banking Committee in September 2016. Management never took responsibility. Although he never took responsibility for the Wells Fargo account fraud scandal, he and the head of retail banking were denied tens of millions of dollars in stock and bonuses. Stumpf resigned as CEO of Wells Fargo the month after the Senate hearing. Whether it was managements fault or the fault of the staff on the front lines, Wells Fargo had to do some serious damage control to regain trust after this highly regrettable event. "It's a New Day at Wells Fargo"
News of Wells Fargo's illegal activities was a shock to the banking industry, which had viewed the company as rock-solid, especially after weathering the 2008 crisis. The company immediately invested $50 million to increase oversight on the level of individual branches. No more quotas. Today, employees at Wells Fargo are no longer required to meet sales quotas. It was a hard but necessary move to make. The bank has since experienced a decrease in earnings and currently plans to close 400 of its 6,000 branches in 2018. Technology instead of the hard sell. Wells Fargo's current plan is to cut costs and increase profitability by investing in technology in favor of relying on salespeople to generate profits. Wells Fargo's strength will continue to ensure its growth. The company that has survived all economic crises over the past 160+ years continues to be a solid financial institution. It's the third-largest bank in the United States by assets, with a total of more than $1.9 trillion (JP Morgan Chase and Bank of America hold the top two spots). With a market capitalization of $314 billion at the end of 2017, it also stood in a solid third place. 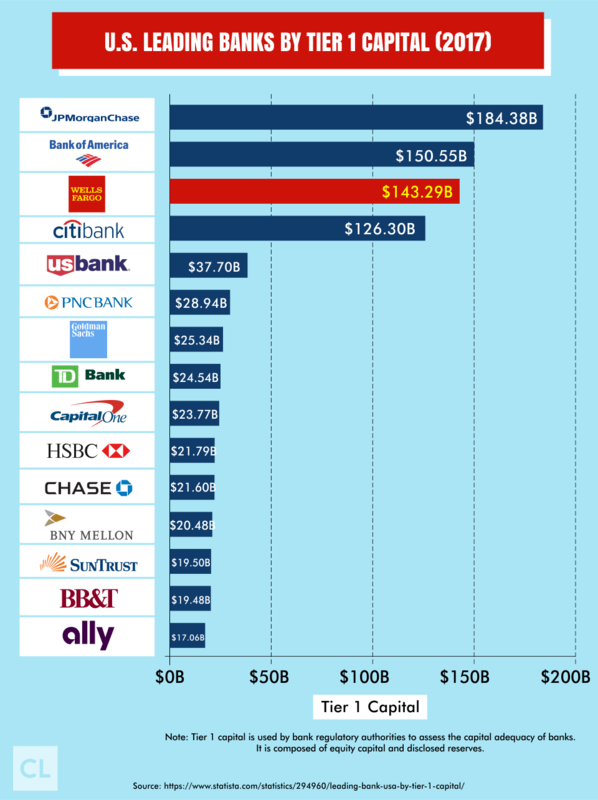 Today Wells Fargo is the eleventh-largest bank in the entire world. Although it came in at number 27 in the 2016 Fortune 500 list of the biggest companies in the USA, it's primary shareholder—Berkshire Hathaway—is fourth on the list. The "Oracle of Omaha" approves. Berkshire Hathaway—the investment company led by financial guru Warren Buffett—owns 9.9% of Wells Fargo. The bank is Berkshire Hathaway's biggest single investment, with a stake valued at $29 billion. Buffett has declared his confidence in the new CEO, Tim Sloan, and his hard work in renewing the company and restoring trust in Wells Fargo. When America was expanding West in the 1850s, Wells Fargo was there with delivery and banking services to help make it happen. At the moment railroads appeared, Wells Fargo was right on board, creating the first coast-to-coast express rail service to ever travel in the United States. Wells Fargo has been through the trenches of depressions, recessions, panics, and other economic crises and always came out the other end stronger than ever. Its history demonstrates how strong leadership delivering on strategies like acquisitions and investments have been the key to its ongoing success. Regrettably, Wells Fargo has fallen victim to its own thirst for success in recent years. Its misplaced emphasis on cross-selling got completely out-of-hand, and many people lost their jobs or their money as a result. It was one of the darkest times in its 166-year history. 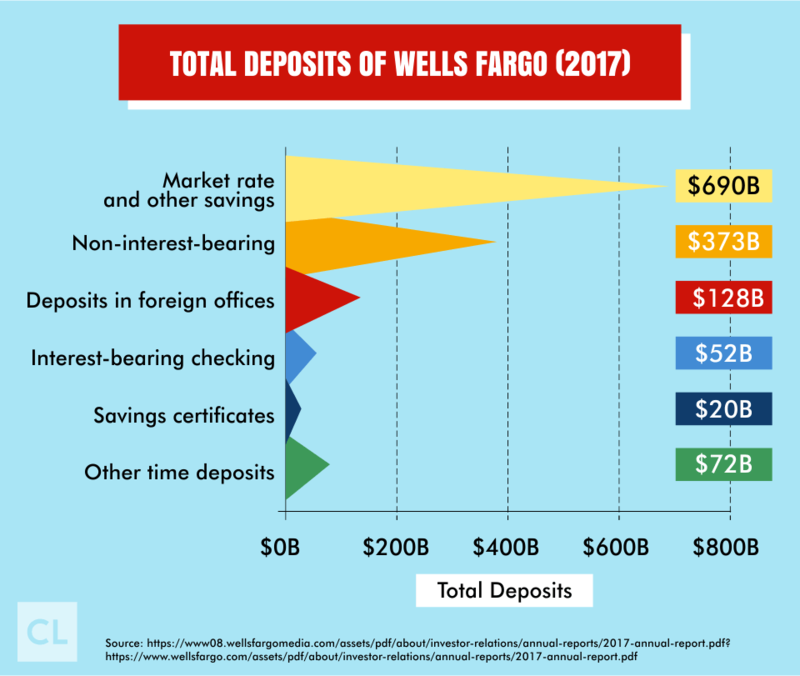 Despite these challenges, Wells Fargo remains one of the dominant banks on the national and international level. I find it somewhat inspiring to know Wells Fargo Bank is returning to its trusted historical roots to rebuild the faith it has lost from its customers. What are your thoughts about Wells Fargo's "Re-established in 2018" campaign? Do you use any of Wells Fargo's financial products?